I arrived in Paris yesterday for the Paris climate talks, officially known as Conference of Parties or COP21. The ultimate goal of COP21 is a binding agreement signed by world leaders that will reduce global carbon emissions to limit global warming to 2C or 3.6F. COP21 began Nov. 30 and runs through Dec. 11. I was looking forward to my first evening as I was hoping to get the chance to meet Yeb Sano, a former Philippine climate commissioner, who embarked on a 930-mile walk from Rome to Paris to arrive just in time for the climate talks. Soon after I arrived at the event, I saw Sano and had the chance to ask him a couple questions. First, I asked him what his greatest hope was for COP21. "Well I have an aspiration for COP21 to be the miracle that it should be," he replied. "We have been walking from Rome to Paris for close to 650 days. We have hope in our hearts that the miracle can happen here in Paris. It is really the only one that can provide the success that the world deserves. So I ask world leaders, please do not stand in the way from that miracle happening. I appeal to them that they look into their hearts and hear the clammer for change and transformation, and build a future that is safe, peaceful, harmonious and sustainable." I asked him what else he'd like EcoWatch readers to know. "There are tons of things I want to say, but I want to talk about this particular moment right now where we are celebrating the Fast for the Climate for what it has become," Sano said. "It is now a big family, a global family of people from different cultures, different spiritual traditions, different creeds and different nationalities. It is a beautiful paradox and I think we are all united in solidarity with our common purpose of building that beautiful future for all of us and our children. Solidarity is not some alternative in our current circumstances as we face the climate crisis. Solidarity is our only chance. And that means solidarity across faiths, solidarity across generations and solidarity across boarders." Last night's event was the culmination of a one-day fast where thousands of people from more than 90 countries fasted in solidarity with vulnerable people and to call for a just transition toward a safe climate future. The purpose of the evening event was to break the fast and join together to celebrate unity across faiths, cultures and continents as well as civil society's global leadership toward climate action. 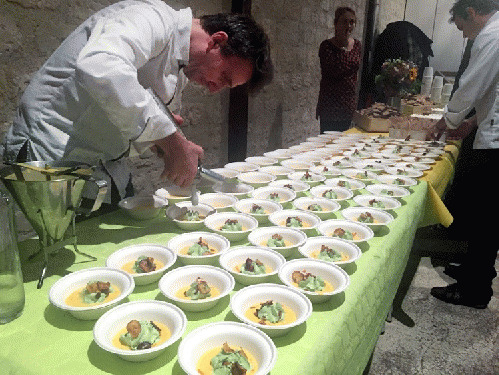 The dinner featured sustainable, local, seasonal vegetarian food cooked by Climate Delicious (Bon pour le climat), and performances from prominent music and spoken word artists. Sano was joined last night by faith leaders including archbishops, imams, rabbis, general secretaries and bishops, civil society leaders, Marshallese poet and Climate Summit 2014 speaker Kathy Jetnil-Kijiner and Earth Guardians founder Xiuhtezcatl Martinez, amongst 200 other participants. This was hardly the the first time people fasted for the climate. 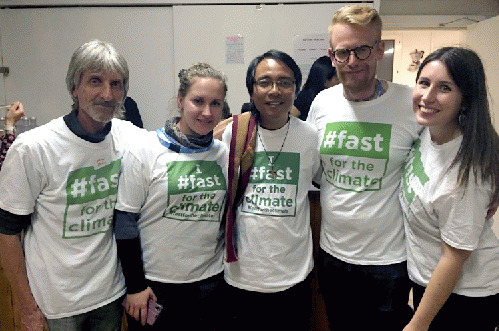 The event in Paris and others like it worldwide celebrate the global growth of the Fast for the Climate movement. Sano helped ignite the Fast for the Climate movement during his speech at the UN Warsaw climate talks when he declared, "I will voluntarily refrain from eating food during this COP until a meaningful outcome is in sight."